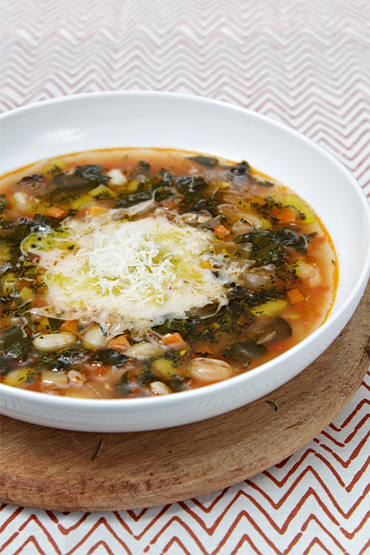 The minestrone soup featured here is a case it point. It’s loaded with veggies as well as two superfoods: cannellini beans and farro. “Packed with deep, earthy flavors and loaded with good-for-you nutrients, it’s superb with a slice of crusty bread – a favorite one-stop meal in this household!” Viviane Bauquet Farre of food & style, who created the recipe, exclaims. In addition to the beans and farro, the soup includes kale, canned plum tomatoes, onions, garlic, carrots and a potato. “The soup is extremely easy to make, but it does take a bit of time to cut all the vegetables to size – a very worthwhile task though, as the assortment of all the veggies, cut in perfect, tiny pieces, makes the minestrone most delectable” Viviane says. Viviane suggests serving the soup with a drizzle of rosemary-infused extra virgin olive oil. If you don’t have any rosemary, drizzle on a good olive oil like our medium-robust Arbosana, which pairs well with hearty soups.